This is one of our favourite breads to make. Typically I used to use eggs and cows milk but now we have opted for more plant based foods for health reasons and to save our beautiful planet and animals. So when my neighbour gave some of her organic bananas off her tree, she apologised they were too ripe but I couldn't resist them and instantly thought of making banana bread! I made a double batch of this recipe however use the below quantity that fits into a regular size bread tin. 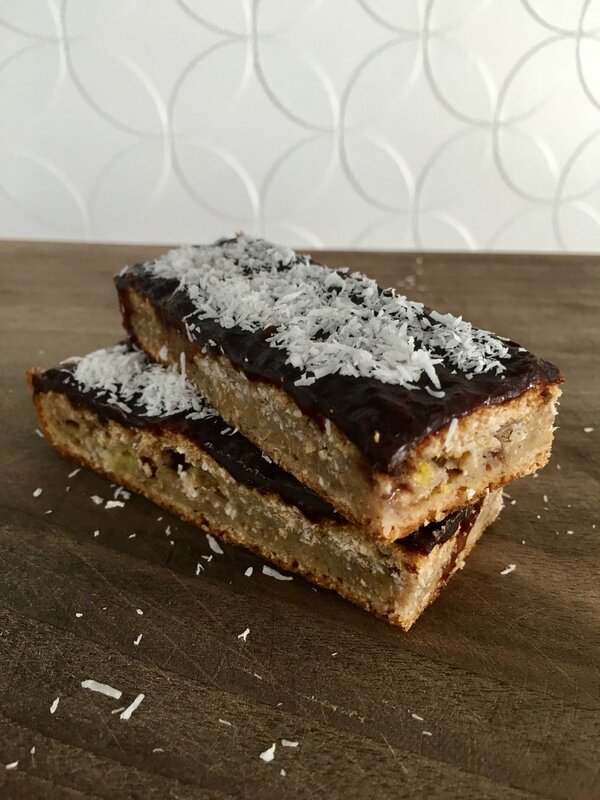 I made extra to create some banana coconut bars which I'll drizzle chocolate ontop or some sort of healthy icing. Preheat oven to 180C degrees. Place baking paper or grease a loaf pan. Mix all dry ingredients together in one seperate bowl and set aside. In another bowl mash bananas until you get a chunky smooth consistency, add vanilla essence, milk and oil. Stir until it's all evenly combined. Pour wet ingredients into dry ingredients. Fold until combined. Mixture should be relatively thick to be poured with ease however if it's too thick simply add a splash of extra milk. Please let me know how you go when you make this. My double batch was baked I'm a more shallow square dish so I can make mini banana bars with chocolate drizzled on top and I'll freeze them for the kids snacks at lunch next week. Melt coconut oil, cacao powder and rice malt syrup or maple syrup until you get a smooth chocolate consistency. Pour over cake and set in fridge overnight or until set 3-4 hours. Cut into bars and sprinkle dessicated coconut. Yum! "Philippine legend tells of a beautiful girl meeting a strange man in the wild and falling deeply in love with him. He admits to her that he is a spirit not of her world and must soon leave her forever, but their attachment is so strong that a part of him is left behind, in some versions his heart and in others his hands. The forlorn girl buries the remains in the ground and from this remnant sprouts the first banana tree, a token of their enduring love. With their suggestive shape, sweet flavor and creamy texture, bananas make a great Valentine’s dish on their own or paired with chocolate, caramel or other delectables. They also happen to be a great source of potassium and contain bromeliad enzyme, which may increase male libido." Are you a banana fan? I hope so! As I'm sure you'all find these recipes very a-PEEL-ing!